We offer different types of Vertical Turning Lathe machines, which are fabricated using superior grade raw material that is in compliance with the international quality standards. Besides, these machines can be customized to suit the individual specifications of our clients. We offer a high performing range of Double Column Vertical Turning Machines, which is made to precision as per the industrial standards. 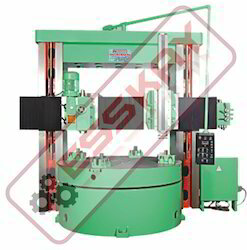 Our esteemed clients can avail from us high quality Double Column Vertical Turning Machines, which are specially designed using high grade raw material. This material is procured from our trusted vendor base, which has vast industry experience and knowledge. We offer a high performing range of Double Column Vertical Turning Machines series "PVTL", which is made to precision as per the industrial standards. Our esteemed clients can avail from us high quality Double Column Vertical Turning Machines, which are specially designed using high grade raw material. This material is procured from our trusted vendor base, which has vast industry experience and knowledge. Looking for Vertical Turning Lathe ?